Importance of finding yourself, knowing who you are? -It’s the starting key to your happiness. -Define yourself with your values. -Invest in Truth to yourself, not lies you make up about yourself. -Focused energy, no wasting on fakery. -You will get good at what you love. -Do you identify yourself with external entities? Hockey team? Imaginary boundaries of a fiction called a country? Animals don’t have borders. Does their nature change because of what is around them? They just BE what they ARE. -Identify the values that will define your desires, aspirations, what you enjoy, and the values that represent what you don’t enjoy. -Identify the values and likes to focus the energy on the right things. Get to the essentials, to the essence of YOU. Who am I, Empire J? -I love Science fiction. Why science fiction? To me it’s representations of what could be. The value of betterment, exploration, curiosity, evolution, problem solving, intelligence. It’s the stimulation of the imagination, to dream of wild potentialities. Even as a kid I was a visionary on many possibilities for humans. -I love technology. I always want technology to solve problems, simplify life. We know that’s not always the case. Sometimes it complicates our life. Technology for me is a manifestation of science fiction dreams. -I eat computers. Why like computers so much? They are tasty. Was on computers since I was a kid. All self-taught. I realized then that you could do EVERYTHING on a computer, and it represented a physical manifestation of some ideas from science fiction. I had the vision to understand everything a computer would be able to do in coming years. As computers were able to do more and more, I explored those features and capabilities as they came out. When graphics evolved, I would explore image creation using expanded color palettes. When communication was possible through modem, I learned to connect to BBSes and host my own for 9 years. When sound evolved, I explored making music, and digital sound editing later on, to now express that expertise through this show, among others. That’s why I enjoyed the music of Tangerine Dream even back then, because to me it was a manifestation of the possibility of electronic keyboards and evolving sound technology to create something new, different, intelligent in it’s beautiful complexity. Video came along, and then came exploration of video trans-coding, DVD ripping/conversion, DVD video production, Video editing. -Other values I hold dear: Betterment of people/society, hence exposing corruption. Truth, integrity. Integrity I am, truth I give. Simplicity, decomplexifying, vulgarizing. -Not ambitious. Working on that. Intrigued when saw the question on a dating site. I figure some women, liking resource gatherers, must be something they need to gauge. -How do you know who you are? -Explore as many things as you can when you are young. Do everything 2-3 times to see if it’s your thing. -Find what you enjoy doing, to the point where it doesn’t feel like work, so that you can live off of that. -Find the means to do what you enjoy. -Associating with people with common values, goals and understandings. -You need to find out who you are to find the right groups. -Remain open to exploring new groups, new people and experiences to learn, evolve, change, adapt your understandings, values, tastes, needs and wants. -Confidence is oneself through knowing oneself. Know how you will react in various situations by experiencing them. Once you have done it, you know what to expect of that situation, and of yourself. -Manipulators are not attracted to confident people. -How do you know you have confidence? –If everything burns down around us, I know things will be fine. 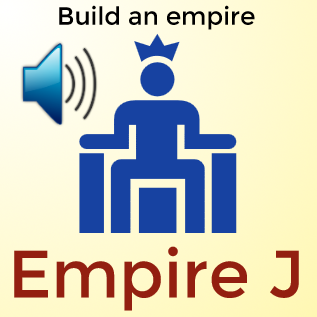 "empire j" in Podcasts app, iTunes or Google Play. Copyright Empire J, All rights reserved.